Mobile Health Computing: Do I Miss My Netbook? Do I Miss My Netbook? Well, if you're a purist, then you probably wouldn't call it a netbook. 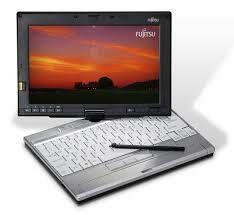 I used to have a Fujitsu Lifebook p1610 that had a 9" screen and a tiny keyboard. In today's terminology, it may be considered a convertible tablet netbook. It's ultraportable and tiny, so most people would probably call it a netbook now that Asus has a convertible tablet netbook with their Eee PC T91. Why not? Well, to be honest, the keyboard and screen were too small for me to be meaningfully productive. I'm much happier with my Lenovo Thinkpad X200 Tablet. With a larger screen and a full-size keyboard, I can be so much more productive. It's a bit bulkier than my p1610, but I'll trade that anyday for the functionality that I gain.